Come join Shannon for a Dream Catcher Workshop! The Native Americans Believe that the air is filled with both good and bad dreams. Dream catchers were hung in the teepees, lodges & also a babies cradleboard. Legend has it that the good dreams pass through the center hole to the sleeping person. The bad dreams are trapped in the web where they parish in the light of day. 11-2pm approx. We are giving a 3 hour approx window. Time ending depends on your pace level. You could finish earlier. Cost is $30.00. Includes materials (7 inch hoop, leather, feathers and beads). The dream catcher pictured is just an example of what kind of style you can create. If you wish to purchase additional beads,charms to personalize your dream catcher. We have them available for sale. 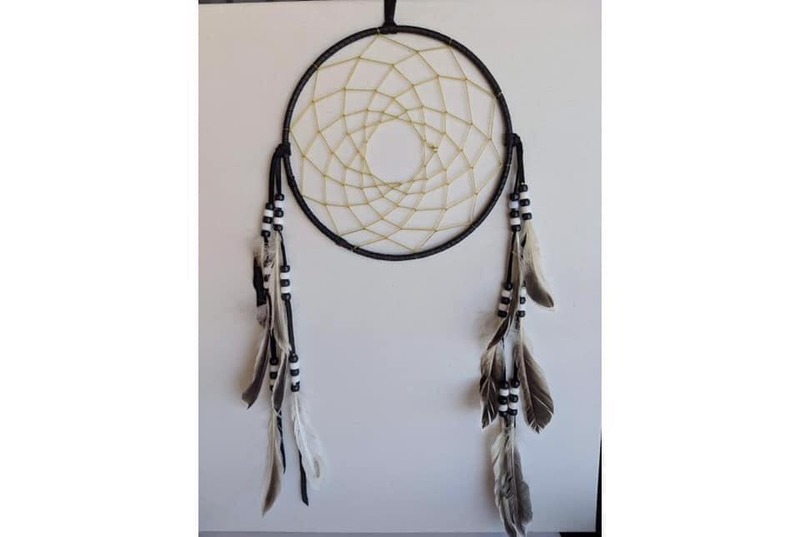 You may bring any items you wish to add to your dream catcher as well. Please call us between Mon-Friday 10-6 Saturated 10-5 at 321-453-2665 to reserve your spot in class. Prepayment is required so we can prepare for class. *****Class size is limited to 10.